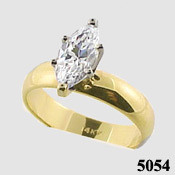 Stock #5054:Marquis cut Russian Cubic Zirconia... in 14K Gold 6-prong, 4 mm Wide Solitaire Ring. Top Quality Yellow Band with White head... Unbelievable Price!! russian CZs are more precisely cut & polished of the best CZ quality available... VERY NICE STONE. Also available in Solid 14k White Gold.